There is a lot of exuberance about data science as a career choice among young professionals. This exuberance (for once) is not at all irrational because the field has tons of potential. I have been asked on many occasions by professionals considering a career change to data science and young graduates trying to start their careers in data science – what does it take to be a great data scientist? This article is my effort to highlight a few key aspects about a career in data science. In this article, I would also like to suggest that there are various facets to being a data scientist. In my opinion, the best way to choose a career in data science is to understand your strengths and interests and find the right area for yourself within data science. Hence my advice to all aspiring data scientists is – know thyself and play to thy strengths! I was born in a Hindu family, and I must say I am always fascinated by Hindu gods. This is natural since it is believed that there are 330 million Hindu gods! However, the most revered gods are the trinity of Brahma – the creator, Vishnu – the preserver, and Shiva – the destroyer. In Hindu art, these gods and goddesses are often displayed with multiple arms each depicting their omnipotence. For instance, a Hindu goddess holds many instruments in her hands like a dagger as a sign of her being a warrior, a musical instrument for her artistic talent, a book for her ability to learn, wealth for maintaining the order of life, and many more instruments to display her omnipotence. The reason I told you about Hindu gods and goddesses is because being a data scientist requires mastering many skills like the gods – no one human can have all these skills. This is precisely the reason, I believe, a complete data scientist is actually a team (set of talented individuals) and not one individual. If you are an aspiring data scientist, I suggest you read the list of skill sets I have presented in the next segment and figure out which of these skills you have the natural talent for and are most keen to learn. Data science offers its practitioners a large number of choices to develop their careers. 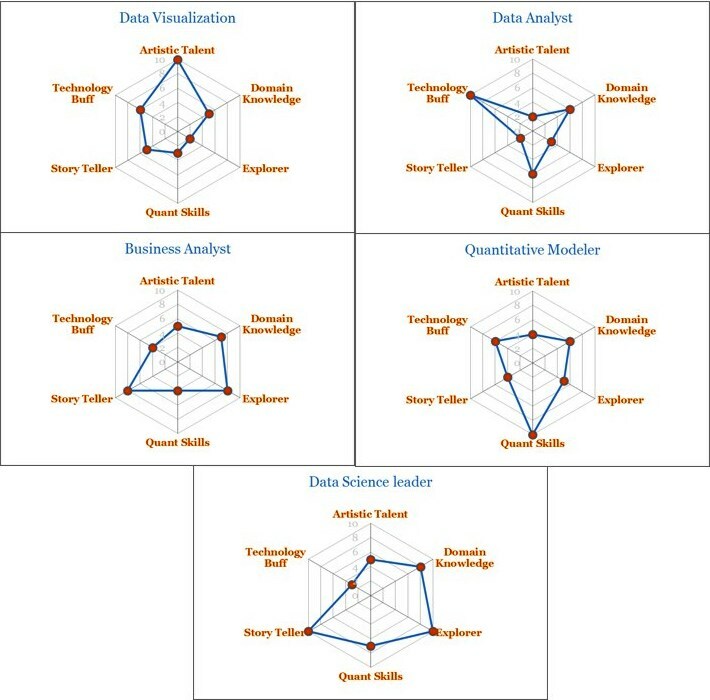 Data science requires its practitioners to possess several skills. I have grouped these skill sets into 6 broader categories in this section i.e. artistic talent, domain knowledge, explorer, quant skills, storyteller, and technology buff. These skills are arranged in alphabetic order as I believe that rather than any one of them being paramount, each of these skills is important for a team of data scientists. Some people have a great eye for right color combinations, and designs. They don’t mind spending several hours fixing minute details in designs to give a visual treat to their end audience. This is a sense of great pleasure for people with artistic talent. You will find people with this kind of artistic talent in visual arts, advertising, and cinema. You may not agree but I believe that data science presents another career option for folks with artistic talent. Domain knowledge equips data scientists to have an understanding of the business they are trying to enhance such as banking, retail, healthcare etc. This is one of the most tricky skills to possess since with domain knowledge also come domain biases. It is essential for data scientists to be objective and neutral. Hence, data scientists must aspire towards knowing enough but never know-it-all. In my opinion, it is often the gap in knowledge that leads to great business insights and a good data scientist is open-minded to look for these gaps. Christopher Columbus, Albert Einstein, Steve Jobs were all explorers. For explorers like them, the idea of going to places no one has ever been, and drawing roadmaps for others to follow gives them a great sense of satisfaction. They are not averse to risk taking for ideas they believe in. They are also voracious readers and try to gain every bit of knowledge from the existing body of knowledge. They are great at connecting the dots between different areas of knowledge and create their own unique path for people to follow. ‘How many tennis balls you could fit in an empty Boeing plane?’ – this kind of puzzle is a source of excitement for people with quant skills. They are great with maths and numbers. They are also well trained in tools and techniques of statistics and machine learning. Quants are an essential part of a data science team. If you have seen Steven Spielberg movie Lincoln then you must have realized that Abraham Lincoln was a great storyteller. He used this art to connect with people of America in one of the most difficult times for his country and paved the way for the creation of this powerful nation of our times. Storytelling for data science is not about presenting a work of fiction but facts in the most coherent way possible. Storytellers connect with people and they keep people engaged. The best storytellers, like Lincoln, put forth difficult ideas in front of people and take responsibility for the consequences. Map reduce, Pig, Hive, WibiData, MongoDB, PLATFORA, Sky Tree – phew! The rate at which technology is growing in the big data space it is hard to keep track of. Technology buffs in data science keep the team abreast with the latest technology trends and tools. They also pioneer usage of new tools and ways of thinking in the technology space for the data science team. This is an essential aspect of a progressive data science team. The following is a spider chart presentation with skill sets for each of these profiles. The following spider charts have 6 axes for each skill set. The farther the pointer is on an axis from the center, higher proficiency in that skill is required for that profile. Data science is an evolving field and the above five profiles are just some representative profiles in the current scenario. As the field will grow, creative and talented professionals like you will create new and unique profiles to take the field forward based on their niche skill sets. So, give yourself a chance and play to your strengths. Hindu gods are great and powerful folks but unfortunately, none of us is a god. So, don’t try to be an omnipotent god while choosing your career. But try to be a mortal human who has satisfied his or her true potential and enjoyed it thoroughly during their lives. See you soon with a new article. 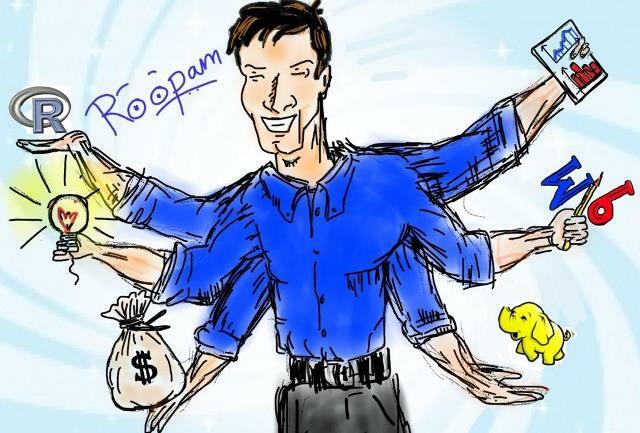 Roopam – Fantastic article. In my role as a Business Analyst, I think holistically about the ways to solve business problems with help of data. I am starting to see an increasing trend towards the need for better Data Visualization which is non existent in real world. Thank you for writing this article!! I love data and the stories that could be told, leading others to fact-based decision making. After 9 years as working as an analyst and 9 as a branding & communications consultant, I am looking to blend my two loves for communications and data. Your spider diagrams and were an awesome way for me to see which types of opportunities I should be looking for in my next 9 year venture. Roopam you rock! very nicely thought and put together article. Thanks Roopam. Great article and I liked your way of combining the tech with Hindu mythology and this is great. Sir I like to know do I need to do any data science course for this or can I utilised my current education and job profile to be data scientist. I think I can be data analyst to start with. Hi Zakir, Sorry for the delayed response. I think you will find this article useful: 3 Pointers for Career Transition to Data Science for Experienced Professionals. Thank you. 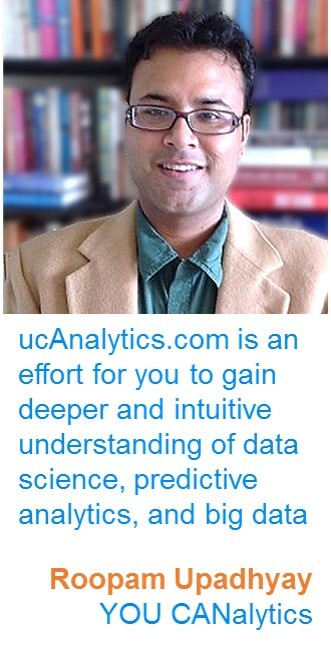 This blog is very informative for an aspiring data analytics student!! After our discussion last year, started exploring the subject. This article is really a path finder for many DS beginners. Very well crafted and useful article. One of th most easy way to get an overview and understanding on DataScience I have read so far. I love your blog and i love this article. Great tips, I learned many things from your post It is very good for everyone. We want your more post because you are making people knowledgeable Which is very important to success. Your article will help people for increasing their business more. Thank for sharing.